As the name says Marshmallow Launcher is a launcher application that gives users Android M launcher experience. This application is offered by Launcher Group. 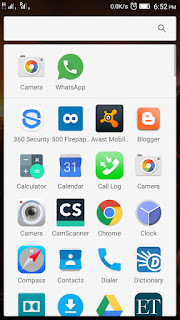 Simply launch the application the first time and it gives the app drawer a Marshmallow look. In addition to that, the search bar and most used applications are displayed and the users can choose to disable them in the settings. The App drawer style can be changed to Vertical, List or Horizontal. The list option shows all the application with a-z sidebar. If you don't like to see certain applications, then the users can Hide Apps. The users can alter Icon size and choose to display the icons name or change its color. Similarly, the layouts of folders and the icons displayed on the home screen can be altered in the Launcher Settings. SignEasy is the simplest and the fastest way to sign documents. The application is provided by Glykka LLC and is available for free in the Google Play Store. 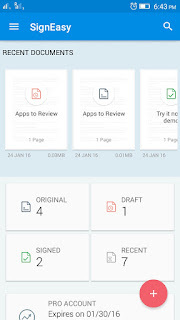 SignEasy application lets the users sign the documents using their mobile device instead of printing the document, signing it and scanning it before sending to someone. Simply import the document, sign and send it. The users can upload a document from Email, SD card, Box, Dropbox, Google Drive or Evernote. The application misses to include the OneDrive. The application supports documents from PDF, Word, Text, HTML to image formats like PNG, JPEG and more. Glympse Express is an easy way to share real-time location details with various types of contacts. The application is provided by Glympse. Glympse Express is a sister application of Glympse application. Unlike the main application, this is a smaller version and only includes share location feature. The application is simple to use. The users have to select an application and the amount of time they want to share the real-time location details. Then the Glympse Express creates a link and allows the users to share that specific link with their contacts. 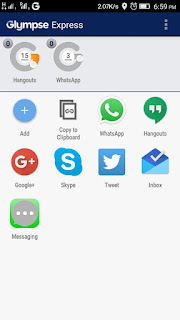 Once the link is created, it can be shared via WhatsApp, Hangouts, Messenger. The user can also send an SMS or Email the link to their contacts or share the link on social networking sites like Facebook, Google Plus, Twitter. The recipients will receive a link to a live map and the live map auto expires. The live map can be opened on any browser and the recipients don't need the Glympse application to view the live map. Cloud VPN is a VPN application provided by Bypass Net. Cloud VPN is completely free for the users with no trail period or upgrades to a pro version. Most of the VPN applications or services have limitations on bandwidth for free users and this one has no limitations. The user interface is simple with a single button to connect and a popup to select the server. 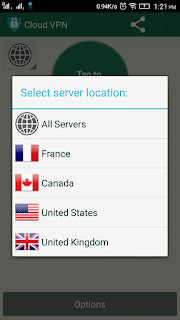 Currently using the application, the users can connect to the servers in four countries namely United States, United Kingdom, France, Canada. The availability of diverse server location is limited. As a note, the developers did mention to avoid peer-to-peer file sharing software's and downloading copyrighted material using the VPN. Everything about the application is manual. The users have to connect to the VPN manually all the time. It doesn't auto connect at the startup. If the connection stays idle, the VPN is disconnected automatically and the users have to reconnect it manually. Doze - For Better Battery Life is a battery saver application and it is provided by YirgaLab. Data drains the battery and turned on for little longer the phone ends with a low battery sign. It is well known to smartphone users and this is where Doze mode comes to play its part. This feature is only available for Android users from Marshmallow but this application makes it available for pre-Marshmallow devices. 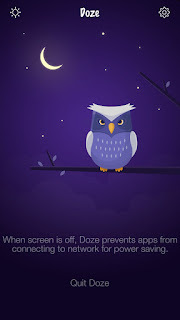 The Doze application reduces battery consumption when the phone is idle by blocking access to the network. The application does this by creating a VPN and without disconnecting the Wi-Fi or data connection. Doze - For Better Battery has an active list and when other applications are added to it then they are allowed to access the network even in the doze mode. The UI is clean and simple. The user can choose to auto quit doze mode when charging or connected to Wi-Fi from the settings. Hitap Indic Keyboard is a keyboard application that supports 12 Indian languages including English. The application is offered by FunnyTap Tech. 33 themes are available, a limited number of them for quick use and others can be downloaded for free. In addition to that, the users can create a custom theme by adding a custom image and selecting keyboard transparency, background brightness, color. 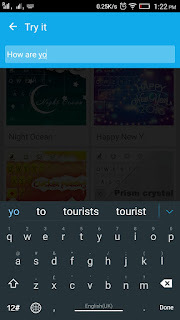 Even though most of the themes look impressive, some themes like Blue Lagoon, Happy New year dominate the keypad making it harder to see the letters and icons. The application suggests words and you can expand it to view further suggestions. In most of the applications, Hitap Indic Keyboard did suggest words, but it didn't suggest any when I'm using Inbox by Gmail. Hitap Indic Keyboard has import contacts feature, once imported the keyboard displays the contact names as suggestions when typing. 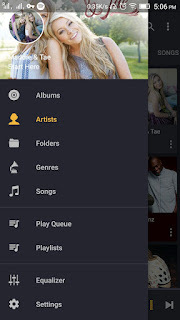 Pulsar Music Player is a lightweight full featured music player currently available only for Android devices. This application is provided by Rythm Software. Pulsar Music Player has very good user interface and animations. You can browse all the available songs or view them by albums, artists, folders, genres. You can exclude selected folders from appearing. 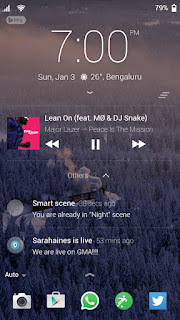 Playlist section of the application displays favorites, most played, recently played and newly added songs along with the user’s custom playlists. Even when you kill the application to free the RAM, music doesn't turn off and continues to play. This, in particular, is an annoying thing to me when it comes to music players where they stop the music. This application doesn't and I'm really happy about it. You can set the currently playing song as an alarm, notification or a ringtone. You need to play the song first otherwise you can't set it as an alarm, notification or a ringtone. I hope they change that. Next Lock Screen is a screen lock application provided by Microsoft. The application promises a time-saving experience compared to others on the market. 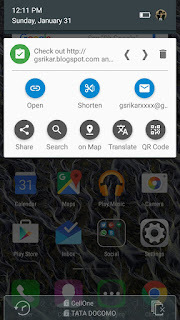 Pin or a pattern lock can be used to lock the screen. Disable your devices lock screen otherwise, you end up unlocking multiple lock screens. Missed calls, Twitter notifications, WhatsApp messages and notifications by other applications are displayed on the lock screen. In addition to that, Upcoming Calendar events of the day are displayed. These notifications can be dismissed by swiping left and opened by swiping right. The application automatically updates the lock screen wallpaper on a daily basis. If you don't like that you always have the option to select and set a custom wallpaper.